According to TCH, Anna Grace and Hope Elizabeth Richards were separated on January 13. A team of nearly 75 surgeons, anesthesiologists, cardiologists and nurses performed the seven hour procedure. HOUSTON - Conjoined identical twin girls have been successfully separated at Texas Children's Hospital. According to the hospital, Anna Grace and Hope Elizabeth Richards were separated on January 13. A team of nearly 75 surgeons, anesthesiologists, cardiologists and nurses performed the seven hour procedure. Anna and Hope have only known life together. 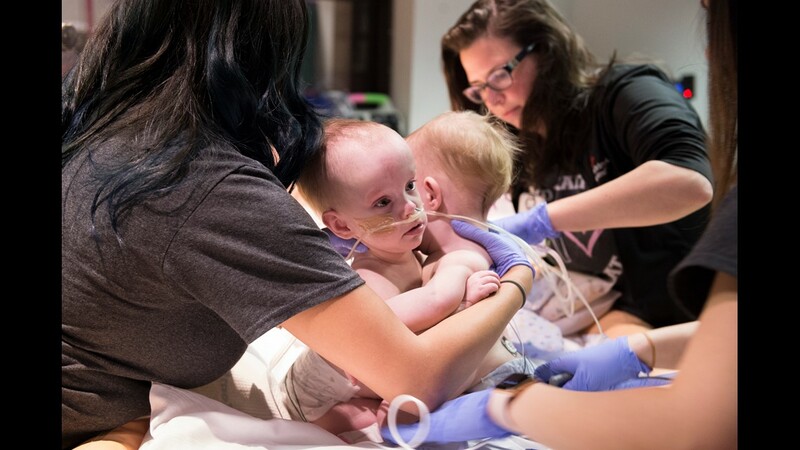 Their mother Jill gave birth to the conjoined twins on Dec. 29, 2016 at Texas Children’s Pavilion for Women, weighing a combined 9 lbs. 12 oz. Delivered via Caesarean-section, Anna and Hope were conjoined at their chest and abdomen, through the length of their torso and shared the chest wall, the lining of the heart, diaphragm and liver. In addition, they had a large blood vessel connecting their hearts. The Richards family, from North Texas, learned Jill was carrying conjoined twins during a routine ultrasound. They temporarily relocated to Houston in order to deliver at Texas Children’s and be close to the girls during their hospital stay. Dr. Olutoye is a pediatric surgeon at Texas Children's Hospital. He started treating the girls even before they were born. He's known how badly their parents have dreamed of separation. "First question parents ask is what will be the outcome for my children," said Olutoye. "And are they going to be separable?" Surgeons at Texas Children's Hospital realized the answer to that question was 'yes'. For a year they started putting together the perfect surgical plan. "We prepared all plans, A, B, C, D just simulating all the things that could possibly go wrong," said Olutoye. So just a month ago on January 13, Jill and her husband Michael said goodbye to Anna and Hope. Doctors wheeled them into the delicate, but life changing surgery. It was time for Olutoye and the team to get to work. "This is not a one man show, not even a five man show," said Olutoye. "You need more more than a football team to do this." The team consisted of more than 75 doctors and nurses working in unison. Anna and Hope had separate spines, brains, arms and legs, but they shared a liver and their hearts were literally connected. "They have two separate hearts, but they were fused with a bridging vein," said Olutoye. So for hours surgeons meticulously followed their surgical plan. The first surgical update midway through moved the Richards' family to tears. Anna and Hope were separated. "You obviously hold your breath until that final moment," said Olutoye. But the work continued. The surgical team split up operating now on two individual patients. The surgery was flawless. "There were cheers in the operating room and high fives," said Olutoye. "It was a really fun time." Seven hours later, each sister was wheeled out of the operating room to recovery where finally Mom and Dad got to see their baby daughters in separate beds for the very first time. Anna and Hope and the rest of the Richards family should be ready to head home to north Texas in about a month. Being able to go back to the family and tell them we've been able to separate your children and then that both of them are doing fine, that's a great feeling," said Olutoye. Those interested in the Richards family’s continued journey can follow them on their GoFundMe page, here.